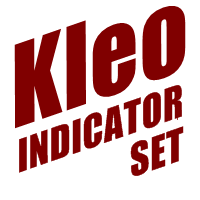 KLEO INDICATOR SET consists of two channels. The first one is enhanced Price Channel (a channel drawn using the maximum and minimum prices for a specified period ) with independently movable upper and lower levels, which also allows marking out the maximum and minimum price ranges as well as the breakthrough points. The second one is a channel with fixed levels drawn relative to the open price of a specified hour, which allows indicating your work time. Bars Number of bars for calculating the UPDATING PRICE CHANNEL. If the value is negative, the channel will not be displayed. Shift from High Shift of the upper level in pips. Line color - (0), see notes. Max delta Maximal range of the price change ((High - Low) value for the Bars period) to consider the channel being absent. If this range is greater than Max delta the levels will be displayed with the other color (4). Min delta Minimal range of the price change ((High - Low) value for the Bars period) to consider the price not moving. If the range is less than Min delta the level will be displayed with the other color (5). Open Hour Hour of the open price used for calculation of the fixed levels. The levels are valid from this hour to the same hour of the next day. High level Upper level = (Open price at Open Hour) + (High level points). Line color - (3). Low level Lower level = (Open price at Open Hour) - (Low level points). Line color - (3). If High level and Low level are equal to 0, the channel will not be displayed. Start time Start time. The levels have different colors depending at working and nonworking time. (3) and (0) respectively. Close time End time. (Start time > Close time) means overnight working time. (Start time = Close time) means twenty-four-hour operation. Digits in brackets are the color numbers in the color set (the Colors tab in the parameters window). Default colors are picked for the black on white color scheme of the chart. All the input parameters are specified as for 4-digit quotes. Recalculation for 5-digit quotes is automatic. 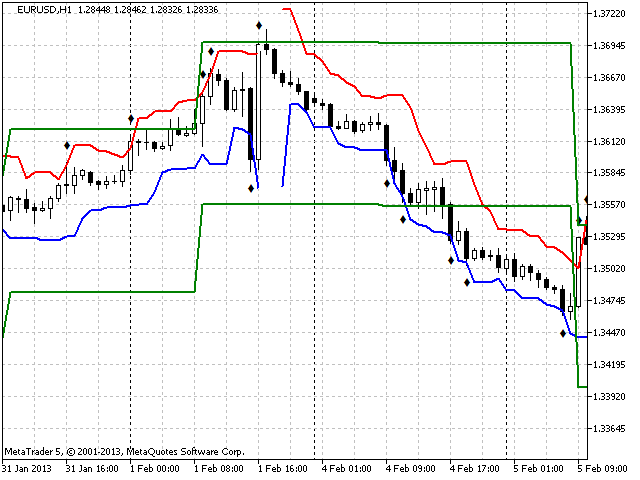 The second channel is plotted on H1 or lower periods. Wait for the working time to start. Wait for the first breakthrough of the UPDATING PRICE CHANNEL levels. The first breakthrough should be considered as "false". At the beginning of the next hour, place pending orders on the channel levels. Set the order on a breakthrough if the corresponding level of the UPDATING PRICE CHANNEL is inside the FIXED LEVELS channel. Set the order on a rollback if the level of the UPDATING PRICE CHANNEL is behind the corresponding level High level or Low level. You can use additional conditions for determining the direction for setting the orders. Wait for an order to trigger. If none of the orders has triggered during the current hour, move the orders to the newly formed level of the channel at the beginning of the next hour. Do the same every hour. If none of the orders has triggered during a certain number of hours, consider the "false" breakthrough as outdated and delete the orders. ("the lifetime" of a breakthrough is determined experimentally). Wait for the next "false" breakthrough. If a position has been opened, delete the opposite order. You can trail the position as you want. For example, you can place a stop on the opposite level (if the breakthrough order has triggered). Consider the range of the price movement during work. If it is less than Min delta or greater than Max delta do not consider the breakthroughs and do not open positions. 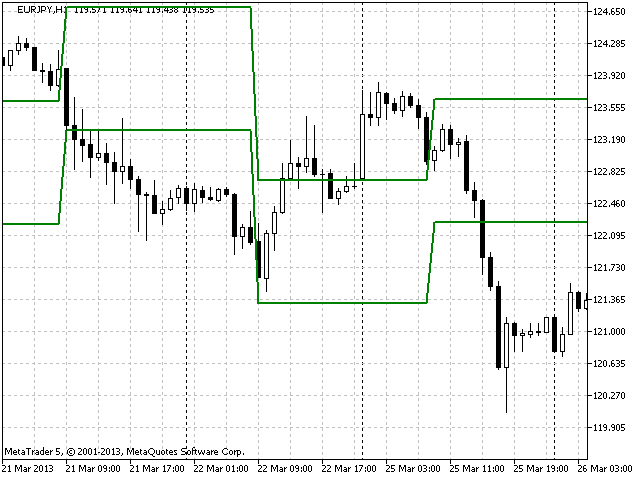 On default, the input parameters of the indicator are set for GBPUSD H1. №1. The fixed levels are not displayed at nonworking time, since the specified color (0) matches the background color of the chart. When the price range is greater than Max delta, the levels are displayed in yellow. The breakthrough points are marked with black diamonds. №2.Breaks of the lines of the UPDATING PRICE CHANNEL - the price range is greater than Max delta. Twenty-four-hour operation. №3. Only FIXED LEVELS (Bars<0). №4. Only UPDATING PRICE CHANNEL (High level =0, Low level =0). Currently I'm preparing to release a multicurrency multisystem Expert Advisor KLEO SYSTEM SET that includes the above described system along with different combinations of conditions for entering the market. A method for getting out of drawdowns, etc. It allows to whether performing a limited number of operations during a day or trading continuously. 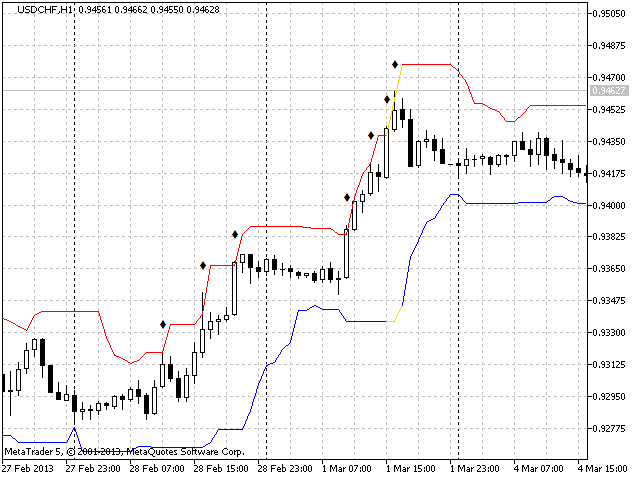 It supports semi-automatic trading - trailing positions opened manually according to the Expert Advisor parameters. It has a lot of built-in checks, what makes the real trading more confident. Watch for new publications in the Market! Now you can load the indicator settings from a file of parameters of KLEO SYSTEM SET Expert Advisor. Save a set file in /MQL5/Files and specify its name in "Load from file" parameter. The currency pair the indicator is used with must be present in EA parameters.